JANUARY 2001: Raynaud's Syndrome: I have had Raynaud's Syndrome since I was 15 years old. Raynaud's Syndrome is linked to mercury poisoning. After reading about mercury poisoning in 2002, I had my mercury fillings removed in 2002 and no longer have Raynaud's Syndrome. Autoimmune Disease: Read about the link between mercury and autoimmune disease here. A positive ANA titer is seen in some lymphomas: Whether the relationship is causal or coincidental, the apparent importance of the possible relationship lies in the fact that the awareness of an underlying malignancy presenting with musculoskeletal complaints may allow for earlier recognition of an otherwise occult, but potentially curable neoplasm. Conversely, knowledge that a connective tissue disease may predispose to cancer may lead to early recognition of predictable malignancy. I also had a swollen lymph node in my armpit that was found and noted in my physical exam records. Chronic sore throats. The sore throats would resolve only when the bridge placed in my mouth by Dr. Keefe was removed. I would later discover that the bridge broke when she installed it. 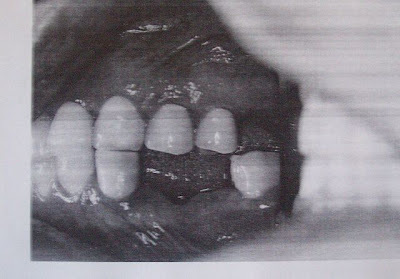 It had a loose post and core and whatever was underneath it (infection and/or cancer) had been leaking into my mouth for THREE YEARS. Night sweats are caused by Chronic Fatigue Syndrome, leukemia, lymphoma and AIDS. I tested negative to the AIDS virus. Low Back Pain is seen in lymphoma. Abnormalities of vitamin D deficiency and secondary hyperparathyroidism are common in patients with leukemia and lymphoma. 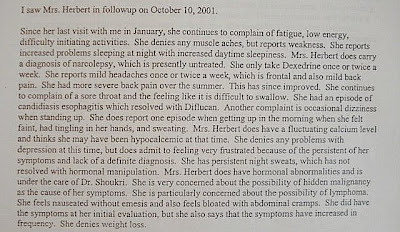 Hashimoto's Thyroiditis and sluggish adrenal function. This is also caused by mercury poisoning and has dissipated since removing my fillings and undergoing thirty chelation treatments. 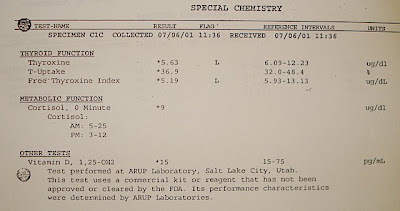 My vitamin D levels were eventually brought up to 28 ng/mL with five doses of pharmaceutical grade 50,000 IU's of vitamin D3 by my endocrinologist, at which point he told me that that was all he could do for me and my visits were terminated. He never told me that low vitamin D levels were found in all cancer patients and indicated a poor prognosis and survival, or that low vitamin D levels could lead to cancer. Hyperinflation and air trapping. I had a completely normal CXR in October 1999. 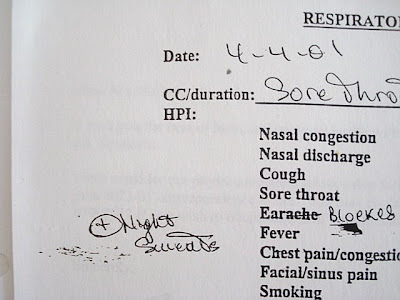 I became very short of breath after Dr. Keefe's dental work and even told my co-workers at the company I was working at when she did the work that I thought I had a "walking pneumonia", it was that bad. Respiratory distress is a common sign of lymphoma. The hyperinflation and airtrapping resolved upon the removal of Dr. Keefe's broken and toxic nickel bridgework in 2003, more than three years after it was installed. Dr. 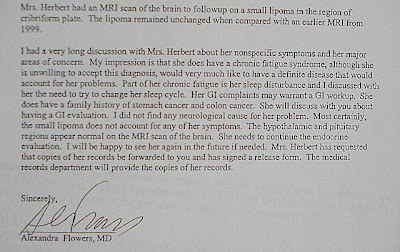 Flowers states in her report: "Most certainly, the small lipoma does not account for her symptoms." This limits the diagnosis of this lesion to inflammation, blood clot, infection or malignancy. Hypercoagulation (blood clotting) is seen in occult or hidden cancers, including lymphoma. Hypercoagulation is seen is some cancers, including leukemia. Mercury, aluminum and lead cause hypercoagulation. Occupational exposure to mercury vapor causes hypercoagulation. Hypercoagulability can be easily detected through the use of the well-known "sed-rate" blood test. Sed rate of less than 5 indicates hypercoagulability. 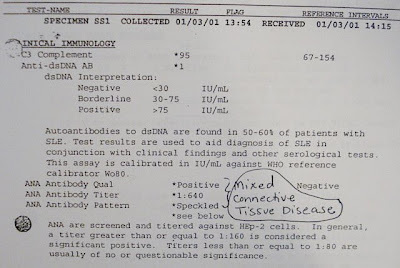 In 2000, my sed-rate was 4. My sed rate is still 4, despite eliminating all exogenous causes of hypercoagulation such as heavy metals and stimulants, five years ago. Is my hypercoagulation being caused by an occult malignancy? The "fat" (ddx: blood clot, lymphoma, etc.) involves a bone called the crista galla, which runs perpendicular to the cribriform plate. It is not in the brain. However, I was never offered a biopsy of the lesion. Instead, I am advised by my doctors to follow up with my dentist. 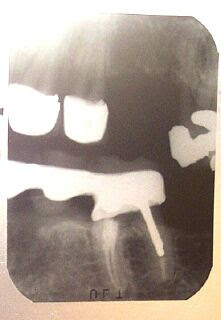 I still did not know at this time that Dr. Keefe had placed a nickel pin into my jawbone, into a tooth that was no good and directly over a potentially cancerous bone lesion and extraction site that had failed to heal . . . .
X-ray taken by Dr. Keefe March 2, 2000. 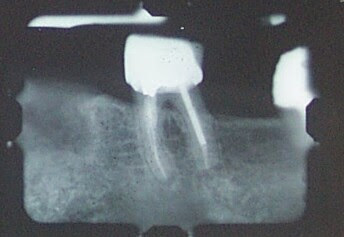 Photograph taken by Dr. Keefe, March 2 - April 3, 2000. On December 5, 2001, I finally made a follow-up visit with Dr. Keefe. Because her husband is a hematologist-oncologist at St. Francis Hospital, and because I truly believed that they were my friends, I was hoping that she can help me solve this dilemma. However, she never showed me this x-ray, which shows that the extraction site had still not healed, and the dark radiolucent bone surrounding tooth #30 was getting darker. Instead, she assured me that everything looked great. Evaluation of carcinogenicity and chronic toxicity associated with orthopedic implants in mice: Nickel shows HIGH carcinogenity, including lymphoma. Myeloma is also caused by nickel. You are so brave and so smart to find all of this on your own! Good luck with everything! I will continue to read with awe at your diagnosing skills. to discuss and upcoming segment with you. Stacy and Max Star in La Muse . . . .